There is one thing in this good old world that is positively sure-happiness is for all who strive to be happy, and those who laugh are happy. Everybody is eligible-you, me, the other fellow. Happiness is fundamentally a state of mind, not a state of body. And mind controls. Indeed, it is possible to stand with one foot on the inevitable 'banana peel' of life with both eyes peering into the Great Beyond and still be happy, comfortable, and serene-if we will even so much as smile. 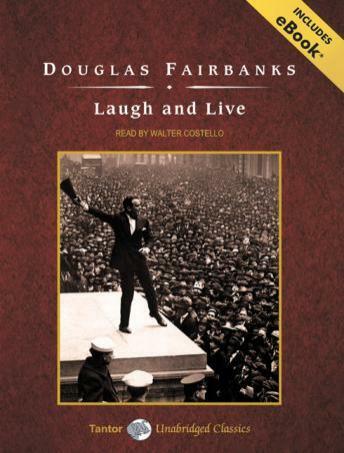 So goes the wisdom of silent film star Douglas Fairbanks, who, in addition to his movie career, wrote a number of self-help books. In Laugh and Live, which was originally published in 1917, he expounds upon his theories for living a good and happy life. Fairbanks's formula for happiness-humility, good humor, and particularly strenuous physical exercise-is enshrined in this and his other advice books.